In 1897 the Delawana Inn first opened its doors as a hotel called the Victoria House, owned and operated by Nathan Nickerson a former Victoria Harbour sawmill operator. For 15 cents a steam-boat would take guests from Victoria Harbour to Honey Harbour, as all guests and supplies had to be transported by boat since there were no roads. Guests of the hotel were offered accommodations by the night or the week. Guests also had the use of boats, meals were supplied, picnic lunches created, and ice cream and confectioneries were available. In the 1920's Nathan Nickerson's son, Charles, sold the Hotel (the Victoria House) to the Grisé brothers. The Grisé brothers at the time were the operators of The Royal Hotel which was directly across the channel from the Victoria House hotel. Fred Grisé, one of the Grisé brothers who was a former liquor store owner (until prohibition ended that venture), took over the operations of the Victoria House hotel. Fred Grise's son, Didace, along with Fred Grise's daughter-in-law, Mary, became the managers of the Victoria House hotel. Didace and Mary raised five sons and four daughters while running the resort, and it was while under the Grisé family operation that the hotel became The Delawana Inn. Legend tells of a local Chief named Delawana who lost his daughter and her two dogs in a tragic rock-fall. In honour of the Chief's loss and his daughter's memory, the Great Spirit gave the area its beautiful Birch trees. The Big Dog and Little Dog Channels that run near the property were then named for the Chief's daughter's two dogs. In 1952 the Victoria House hotel burned to the ground. It was rebuilt. In 1973 the hotel burned to the ground a second time. Again, it was rebuilt. In 1996 the resort changed hands, when it was purchased by a development company from Toronto. In 2013 the resort went into receivership, and after being purchased, reopened its doors in 2014 as the Delawana Resort, dropping the word 'inn' while still keeping the historical 'Delawana'; this was to prevent confusion due to the lack of an actual inn being on the property anymore. For a more in-depth history about the Delawana Inn, please visit the Wikipedia Page. Delawana Resort is a 25-acre self-catered resort located on historical Georgian Bay in Muskoka, Ontario. It's a beautiful and historic area; the bay is rich with legends and folklore, and many of the residents of the area have been here for generations upon generations. What's Changed & What's the Same? Delawana Resort as of 2014 is under new ownership and management. In June 2014 Delawana Resort re-opened as a self-catered Muskoka resort. 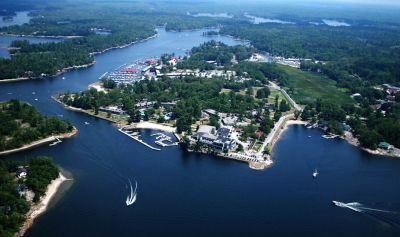 The resort was once run as an all inclusive full-service establishment, but now has become a more affordable vacation destination for those looking for a more laid-back Muskoka experience. Delawana Resort will have many of the existing Sports Facilities and Amenities available for use. Guests will have access to Canoes, Kayaks, Paddleboats, Tennis Courts, Basketball, Outdoor Games, Mountain Bikes, Beaches, Fishing, Docks, Firepits, and of course the great outdoors. For returning guests to note: In the 2019 season, facilities that the resort will not be offering include: Spa, Racketball, Ropes Course, and any of the Main Building Experiences. The Main Building (Main Lodge) will remain closed for the time being, while future developments are being planned and in the making.